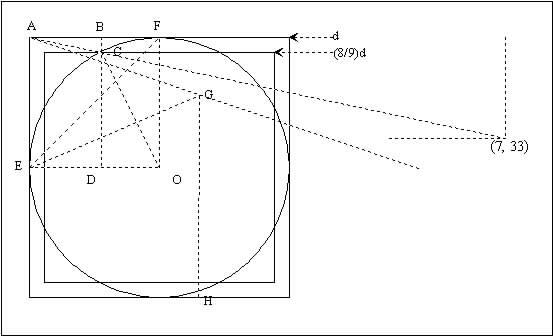 The Rhind Papyrus c.1650 BC, approximates the circle area by a square of side (8/9)d = 0.8888888...d, giving a ratio of 1.003, correct to 3 parts in 1000; very good for such a simple construction. Another way I have found of approximating the equal area square is to draw a line from a corner A of the circumsquare, taken as origin, to a point with coordinates (7, 33). This crosses the circle at a point C on the required square. [Proof: Draw BCD parallel to the side AE. Take the radius of the circle to be 1. Then AE = EO = OC = 1, and CD = sin q, where q = angle COE. The slope of the line AC is CB/BA = (BD − CD)/(EO − DO) = (1 − sin q)/(1 − cos q) = m.
Taking CD = Ök we find q = 62.402886° and m = 0.2119672, which can be approximated by 7/33 = 0.2121212.
where q = sin q; a quadratic equation giving q = CD = 0.886168. This was originally published in The Games and Puzzles Journal vol.2, #18, March 2001, p.325. where it is acknowledged to have been inspired by a less accurate construction in Ein Dutzend mathematischer Betrachtungen by C. R. R. von Schinnern (1826).